On Friday, 8 March, the International Women’s Day, it is time for this year’s Teaser. For our future festival visitors, or if you are interested in exhibiting at the festival – this is meant as an inspiration. The event will be a special evening with a mix of photography, photo art and photo talks with an international touch. Free admission. We welcome the multifaceted Swedish-French photo artist Karin Crona who lives in Paris since many years. In her talk, ‘The Body – a condition’, she talks about how she works with her self-image from an artistic perspective. Crona has explored the self-portrait for over ten years through different genres and techniques. Her artwork is inspired by l’art brut (ie primitive art) and surrealism, characterized by a sense of humour and Scandinavian melancholy. Take part of her stories, performance videos and creative processes. She is also exhibiting a selection of her collage art. The Israeli photo journalist Daniel Tchetchik works at one of Israel’s bigger newspapers; Haaretz, and visits us to show and talk about the photo series “The year that was, through the eyes of Israeli women” – Image of the Year 2018 Women. A year that in many ways can be described as the women’s year in Israel and worldwide; a shift of society in what is actually allowed, and what is prohibited. For this reason, the newspaper gave the scene to the women behind the camera – both amateurs and professionals, and in return, they got a broad perspective of the past year. Venue: Slottsbiografen, Nedre Slottsgatan 6B, Uppsala. The exhibitions are open until 9 pm. Welcome! We have now published the terms for solo exhibitions and also how to apply for ’The Board’. The last date for entry for the solo exhibition is 30 April 2019, and 10 September for the outdoor exhibition. Do you have an idea that you would like to discuss with us? You are more than welcome to contact us via info(at)uppsalafotofestival.se with your ideas. We have extended experience of supporting photographers, discuss different subjects and curate your photos, if needed. 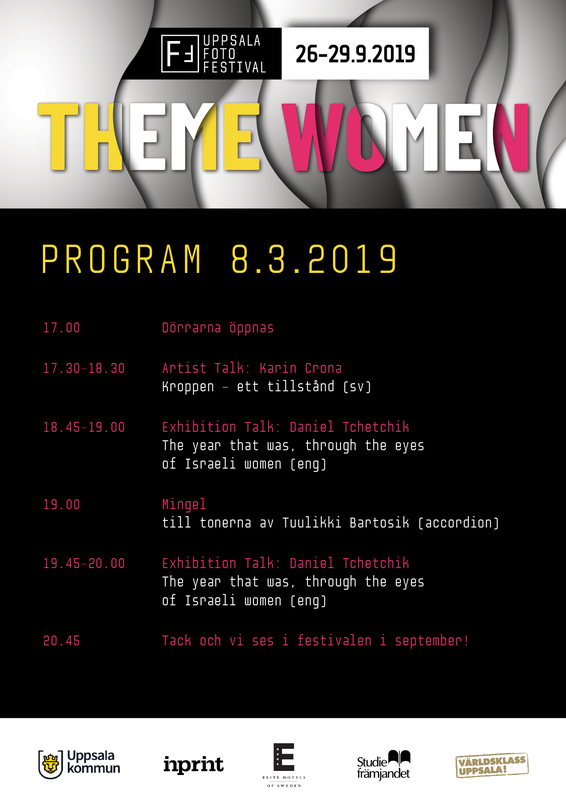 The theme for the nextcoming festival in 2019: WOMEN. We are all in for you! More about the theme, dates, and how you can contribute will soon be on our website. To make sure that the festival has a diversified exhibition programme each year, the board has determined to only let returning photographers exhibit three festivals in a row. The photographer is allowed to apply to the festival’s individual exhibition programme a forth year, but only as a part of a group of at least four persons.